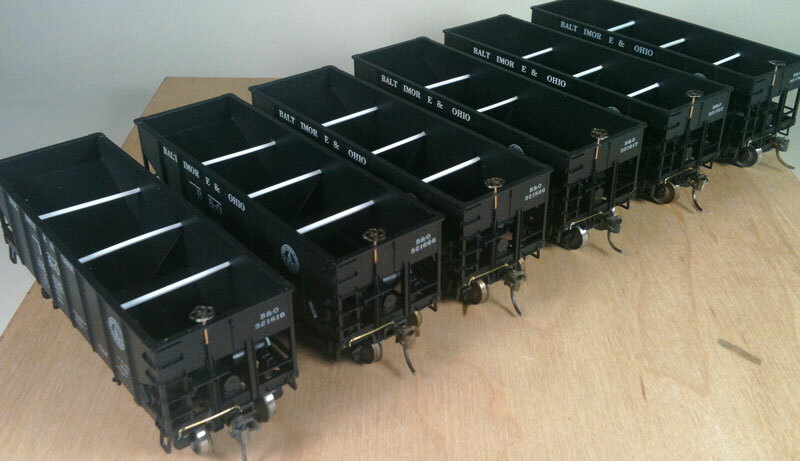 I started assembling and upgrading a six-pack of Accurail USRA hoppers a couple of months ago. These are destined for a club layout in Morgantown, WV so the extra detail has been kept to a minimum. I downloaded a PDF file of an old pamphlet from the Baltimore & Ohio Railroad Historical Society that features detail and images of hopper rebuilding in Keyser, WV. This came in handy when building these models. The prototype hopper cars seemed to receive new AB brake systems in a late 1940s rebuild, but many kept a vertical staff handbrake and wheel. It’s this detail addition that I will focus upon. I wanted to minimize the work needed to install the vertical staff handbrake parts. These specific kits date back to when Accurail had a separate part for the handbrake ratchet, so no detail was removed from the carbody. 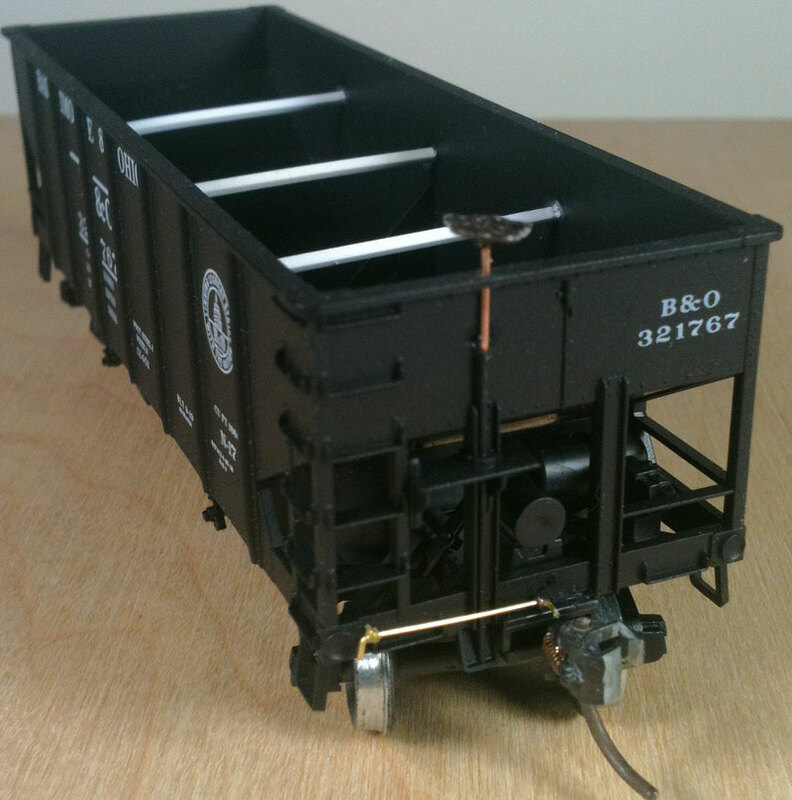 Current Accurail USRA hopper kits will require careful removal of the cast-on ratchet detail. I use 0.020-inch phosphor-bronze wire for vertical brake staffs as this is an easy-to-snag detail and the heavier wire offers a more robust installation. I also used some metal Kadee brakewheels that I had in my stash. These are oversized, but can take more of a beating than Tichy, Grandt Line, or other plastic parts. Remember, these will be used on a club layout where details need to take a beating. The first step is to drill a few of holes. A motorized drill can ease the work in these steps. Use a #75 bit to drill out the hole in the brakewheel. Use the same bit to drill a hole on the car end. Drill at an angle similar to the slope sheet at a point between the top of the cast-on vertical handbrake shaft and the bottom of the hole for the ratchet casting. There is just enough room for this and drilling at an angle makes it easier to do. I also drilled a hole in the lip of the angle at the top of the end. I drilled first from the bottom side, then again from the top to remove the angle and enlarge the hole so the wire fits easily. I then used a nice sewing needle in my pin vise to slightly enlarge both of these holes. The sewing needle can be used to make a starter dimple to enable a little easier drilling for this hole. Here’s a helpful graphic to guide the hole placement. Note this hopper is from a more recent Accurail batch with the brake ratchet detail cast-on. This would need to be removed to about the arrow point in order to add a vertical staff handbrake. Once the holes are drilled, take the 0.020-inch wire and add a slight bend to the very end. I kept my bend about as long as the very end of my needlenose pliers, possibly just under 3/16 of an inch. This angled part will go into the angled hole that was drilled into the car body. Hit the end of the angled wire with a jewelers file to clean off any burr or oddity there, then thread the wire through the hole at the top of the car end and test fit the angled part into the angled hole. It should fit fine. Remove the angled end from the hole but not from the other hole. Place a small blob of thick CA (Super Glue) on the angled hole and the end of the angled wire, then fit the wire back into the angled hole and press it firmly into place. Now you should have a long length of wire sticking straight up at the end of the car. How do you trim that to length? Well, I noted my square jewelers file is about 9 HO inches thick, so I set that on the top end of the hopper and used my flush cutters to trim the wire near-even with the top of the file. Check this fresh cut on the wire and remove any burrs with the jewelers file so there are no problems when you add the brake wheel. Before installing the brakewheel, use a flat jewelers file to remove any of the angled wire that is sticking through the car end and visible on the inside. By keeping the wire short after that angle bend, any extra material seen here is minimized. Take the time to carefully test fit the brake wheel. If it fits fine, then remove it. Using thick CA, add a blob to the top of the wire and to the underside of the brakewheel casting, then carefully refit the casting to the wire. Repeat this process for the number of cars you are building. 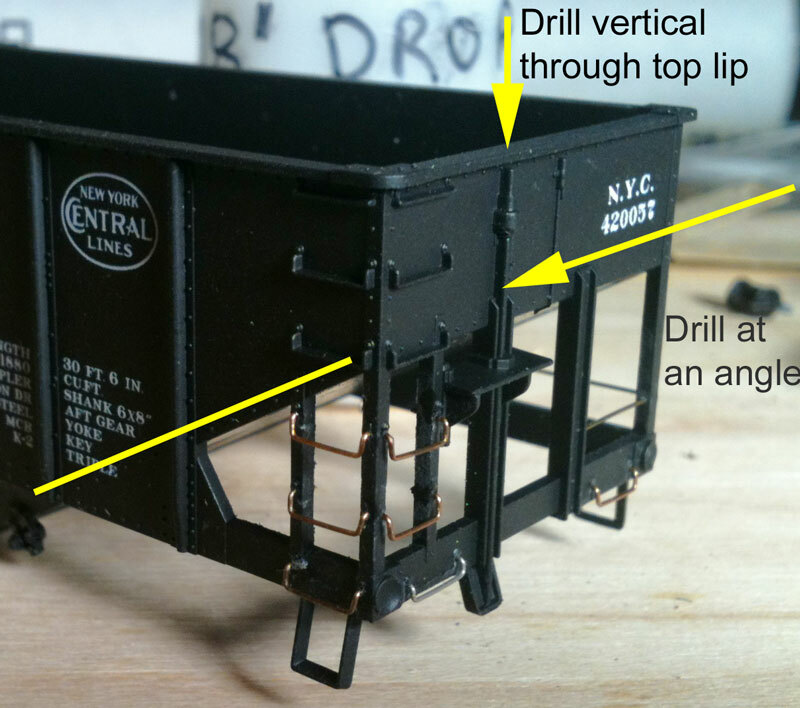 You will be surprised how quickly this detail can be added to a few hopper cars. I let these sit overnight, then I used some thin CA to reinforce all of joints on the vertical handbrake wheel components, especially at the point on the inside of the car end where the angled hole can be seen. After an hour or so it is time to touch up of all new parts. A light coat of weathering will make these cars layout ready. All six hoppers were delivered to the Morgantown club over the Memorial Day weekend. Here’s one of the finished cars on the layout rails and ready for service. A little extra effort with a few details can offer some variety to your hopper fleet. I encourage modelers to use the prototype as a guide and add some extra details to your freight cars. Reader are welcome to leave comments below. All comments are reviewed and approved before they appear here.